But a new study shows a way for that research to reach even more people, so that new ideas and findings can travel farther. By boiling a research paper down into a Twitter-friendly graphic called a "visual abstract", the new study shows, a Twitter user can nearly triple the number of people who click the link in the tweet to read their full paper. The results are published in the Annals of Surgery, a journal that began creating visual abstracts for selected research papers last July. More than 20 journals across medicine, basic science and social science have started doing the same in recent months, spurred by the rapid success of the Annals effort. But the University of Michigan surgery resident who pioneered the use of visual abstracts by Annals, and coined the phrase, wanted to document the specific impact of the approach. Working with colleagues who also serve on the journal's editorial board, Andrew Ibrahim, M.D., designed and carried out a careful study aimed at showing just what impact the visual abstract had in its first months. They chose 44 important research papers for the Annals Twitter account to share, both with and without visual abstracts attached to the tweets. Half of the papers had no-graphic tweets sent out first, then later had a visual abstract tweeted out about them. The other half went in the opposite order. 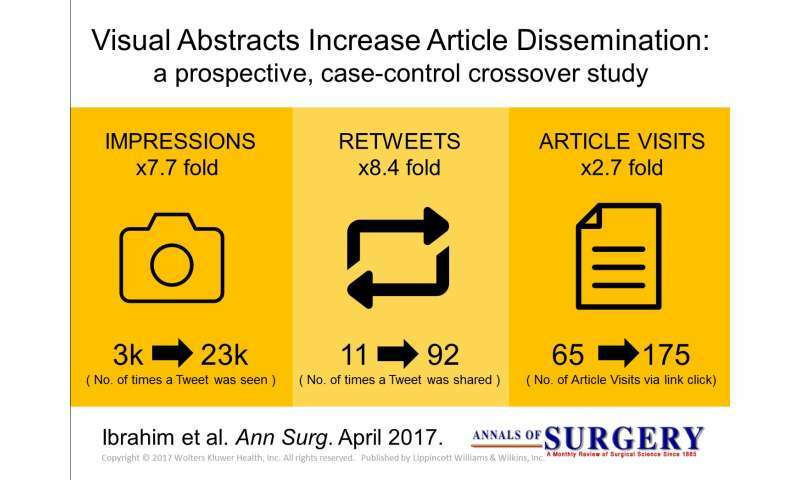 In all, the tweets with the visual abstracts were retweeted more than eight times as often, and were seen by nearly eight times as many people. And 2.7 times as many people clicked the link in a visual abstract tweet to read the full paper. Ibrahim, who is also a Robert Wood Johnson Clinical Scholar at the U-M Institute for Healthcare Policy and Innovation, emphasizes that visual abstracts aren't meant to replace a paper - but rather to act as a "movie trailer" to help busy researchers and clinicians decide if they want to read the full research paper without having to click. Ibrahim, who studied architecture and design as well as medicine, began creating visual abstracts as a way to summarize a research study with just a few icons, words and numbers, aimed at other researchers and people in the medical field. He launched the Annals program as the journal's founding Creative Director, as part of the respected journal's effort to increase its presence and engagement with readers on social media in 2016. "This was a unique opportunity where my skill sets overlapped," he says. "The journal had been automatically tweeting the titles and links for each paper it published, and then we began tweeting graphs or charts from the papers. But our first visual abstract had 10 times the retweets as normal." The study documents the impact of the journal's first 44 visual abstracts, from July to December 2016. The papers were chosen by the journal's editorial board for their broad potential interest to surgeons and surgical researchers. "At first, people were concerned that visual abstracts are a superficial 'click and share' thing," says Ibrahim. "But the fact that it drove up the click-throughs going to the full article threefold means more people are engaged in the work. Still, we will need to study this over the longer term to see if has an impact on citations of those papers." In January, Annals began inviting all researchers whose work was accepted for publication to use a template to create a draft visual abstract for their work. Ibrahim edits them and many are chosen for sharing via the Annals twitter account, which has more than 18,000 followers. Ibrahim has also offered materials on the web for other researchers who wish to create their own visual abstracts, and has helped other journals understand the key principles of designing them. Senior author Justin B. Dimick MD, MPH, who is an Associate Editor at Annals and Director of the Center for Healthcare Outcomes & Policy at U-M, observes, "The uptake from other journals has been rapid. I would not be surprised if every major research is using visual abstracts within the year." Researchers have also begun repurposing their visual abstracts in presentations, on the web, in outreach to reporters, and on other social media platforms. More journals and institutions have begun offering help to researchers, to marry the scientific expertise needed to make a visual abstract accurate with the design skills needed to make it readable at a glance. "We've also modified our design in response to feedback, for instance adding p values so a Twitter user can see the statistical significance of the result," Ibrahim says. "Sometimes we're trying to summarize five years' worth of work in a single graphic, and we never claim it's a substitute for reading the full article or even the text abstract. But it's a way to help people decide if this is a paper they'd be interested in reading or not."